In the United Kingdom hunting without qualification generally refers to hunting with hounds—normally fox hunting, beagling, stag (deer) hunting or minkhunting—whereas shooting is the shooting of game birds. What is called deer hunting elsewhere is deer stalking. As of 2012[update] game shooting and deer stalking are carried on as field sports in Great Britain and Northern Ireland. Hunting with hounds in the traditional manner became unlawful in Scotland in 2002 and in England and Wales in 2005, but continues in certain excepted forms. Traditional foxhunting continues in Northern Ireland. Following a trail (similar to drag hunting) rather than a live quarry has subsequently grown in importance in Great Britain, as has hunting foxes to a bird of prey. The British Association for Shooting and Conservation (BASC) says that over a million people a year participate in shooting, including game shooting, clay shooting and target shooting. In 2005 it became unlawful in England and Wales to shoot flights or game birds while they are not in flight, an action which has long been considered unsporting in any event. Shotguns were improved during the 18th and 19th centuries and game shooting became more popular. To protect the pheasants for the shooters, gamekeepers culled vermin such as foxes, magpies and birds of prey almost to extirpation in popular areas, and landowners improved their coverts and other habitats for game. Game Laws were relaxed in 1831 which meant anyone could obtain a permit to shoot rabbits, hares, and gamebirds, although shooting and taking away any birds or animals on someone else's land without their permission continued to be the crime of poaching, as it still is. Hunting was formerly a royal sport, and to an extent shooting still is, with many Kings and Queens being involved in hunting and shooting, including King Edward VII, King George V (who on 18 December 1913 shot over a thousand pheasants out of a total bag of 3937), King George VI and the present day Prince Philip, although Queen Elizabeth II does not shoot. 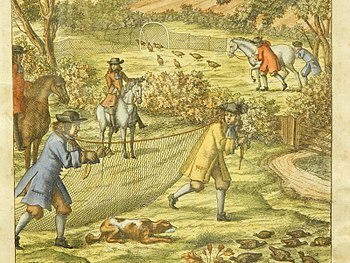 Shooting on the large estates of Scotland has always been a fashionable country sport. This trend is generally attributed to the Victorians, who were inspired by the romantic imagery of the Scottish Highlands. The shooting of game birds, in particular pheasant, is found in the UK, on large, traditional driven shoots on estates and on small-scale rough shoots. Shooting of game birds is carried out using a shotgun, most often 12 and 20 gauge or a .410 bore, often on land managed by a gamekeeper. Shooters are often referred to as "guns". Wildfowling is often[when?] a lonely and uncomfortable sport. [according to whom?] A single gun sits in pursuit of wildfowl by a body of water, or on the coastal foreshore, often at dawn or dusk, and waits for birds to "flight" in. This is sometimes undertaken in total darkness or by the light of the moon. Duck are also shot by the two methods described above. Rook shooting was once popular in rural Britain for both pest control and gaining food, wherein juvenile rooks living in rookeries, known as "branchers", were shot before they were able to fly. These events were both very social and a source of food (the rook becomes inedible once mature) as the rook and rabbit pie was considered a great delicacy. High-powered rifles are used for deer stalking. This may take place high on moors, or from a "high seat" in woodland. Venison is also a highly popular meat with sales quadrupling in the UK in 2014. ^ "BASC". BASC. Archived from the original on 2013-03-28. Retrieved 2013-03-30. ^ Aslam, Dilpazier (February 18, 2005). "Ten things you didn't know". The Guardian. London. ^ "h2g2 - Common Pheasant and Relatives". BBC. Retrieved 2013-03-30. ^ Colin Greenwood, The classic British rook & rabbit rifle, The Crowood Press Ltd, Marlborough, 2006, ISBN 978-1-86126-880-8. ^ "Venison sales quadruple - Shooting UK". shootinguk.co.uk. 25 July 2014. Retrieved 12 April 2018. ^ Natural England. Lost life: England’s lost and threatened species. Worcester, England: Natural England; 2010. ^ a b Oldfield TEE, Smith RJ, Harrop SR, Leader-Williams N. Field sports and conservation in the United Kingdom. Nature 2003; 423: 531-533. ^ Draycott RAH, Hoodless AN, Cooke M, Sage RB. The influence of pheasant releasing and associated management on farmland hedgerows and birds in England. European Journal of Wildlife Research 2012; 58: 227-234. ^ Robertson PA. Woodland Management for Pheasants. Bulletin 106. UK: Forestry Commission; 1992. ^ Sage R, Swan M. Woodland Conservation and Pheasants. Fordingbridge, UK: The Game Conservancy Trust; 2003. ^ Ludolf IC, Robertson PA, Woodburn MIA. Changes in the ground flora and butterfly populations of woodlands managed to encourage pheasants. In: Buckey PJ (ed.) Biological Habitat Reconstruction. London: Belhaven Press; 1989. p312-327. ^ Draycott RAH, Hoodless AN, Sage RB. Effects of pheasant management on vegetation and birds in lowland woodlands. Journal of Applied Ecology 2008; 45: 334-341. ^ Callegari SE, Bonham E, Hoodless AN, Sage RB, Holloway GJ. Impact of game bird release on the Adonis blue butterfly Polyommatus bellargus (Lepidoptera Lycaenidae) on chalk grassland. European Journal of Wildlife Research 2014; 60: 781-787. ^ Sage RB, Ludolf C, Robertston PA. The ground flora of ancient semi-natural woodlands in pheasant release pens on England. Biological Conservation 2005; 122: 243-252. ^ Sage RB, Woodburn MIA, Draycott RAH, Hoodless AN, Clarke S. The flora and structure of farmland hedges and hedgebanks near to pheasant release pens compared with other hedges. Biological Conservation 2009; 142: 1362-1369. ^ Pressland CL. The impact of releasing pheasants for shooting on invertebrates in British woodlands. Ph.D. Thesis. Bristol: University of Bristol; 2009. ^ a b Parish DMB, Sotherton NW. Game crops as summer habitat for farmland songbirds in Scotland. Agriculture, Ecosystems and Environment 2004: 104: 429-438. ^ Boatman ND, Stoate C, Watts PN. Practical management solutions for birds on lowland arable farmland 2000; In: Aebischer NJ, Evans AD, Grice PV, Vickery JA (eds.) Ecology and conservation of lowland farmland birds. Tring, UK: British Ornithologists’ Union; 2000. p43-54. ^ Stoate C, Szczur J, Aebische NJ. Winter use of wild bird cover crops by passerines on farmland in northeast England: Declining farmland species were more abundant in these crops which can be matched to the birds' requirements. Bird Study 2003; 50(1): 15-21. ^ Henderson IG, Vickery JA, Carter N. The use of winter bird crops by farmland birds in lowland England. Biological Conservation 2004; 118: 21-32. ^ Sage RB, Parish DMB, Woodburn MIA, Thompson PGL. Songbirds using crops planted on farmland as cover for game birds. European Journal of Wildlife Research 2005; 51: 248-253. ^ Stoate C. Multifunctional use of a natural resource on farmland: wild pheasant (Phasianus colchicus) management and the conservation of farmland passerines. Biodiversity and Conservation 2002; 11: 561-573. ^ Ewald JA, Callegari SE, Kingdon NG, Graham NA. Fox-hunting in England and Wales: its contribution to the management of woodland and other habitats. Biodiversity and Conservation 2006; 15: 4309-4334. ^ Lisa Gazeley (16 December 2010). "Queen Elizabeth's Hunting Lodge". City of London official website. City of London. Archived from the original on 12 June 2011. Retrieved 31 May 2011.